Late opening will not occur on 19th, 20th, 21st, 22nd and 23rd December and during November- please call us first to check opening times on those days. 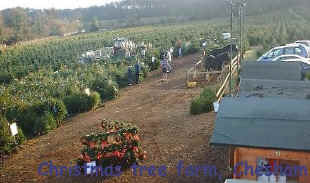 we are one of the largest Christmas tree growers in the London Area --- Fresh Christmas Trees direct from the grower. If your supplier has trees delivered on a pallet thay are probably not very fresh!